inscription: Allied Printing (#146, Northern California)/Autumn Press and recycling logos in green at the bottom left corner. Poster has an unprinted white border all around enclosing a background image of a bird''s eye view of a baseball field, with the stands blurred. At the top of the poster is "Sheriff Michael Hennessey, the S.F. 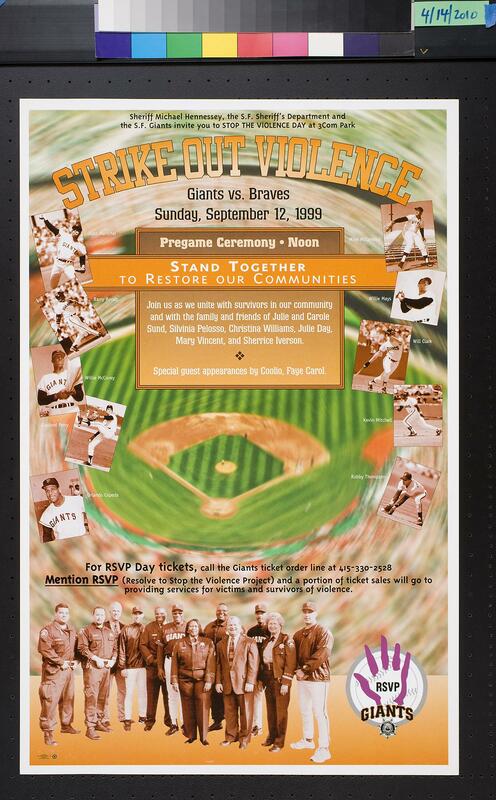 Sheriff''s Department and / The S.F Giants invite you to Stop The Violence Day at 3Com Park" in black, "Strike Out Violence" in orange and "Giants vs. Braves / Sunday, September 12, 1999" in black. Below the text is an orange text box with "pregame ceremony - noon" in pale orange followed by a bright orange bar with "stand together / to restore our communities" in white. Below the bar, still in the text box, is white text about the purpose of the event and special guests. Down the left and right of the top of the poster are orange tinted photos of Giants players with their names next to the photos in white. At the bottom of the poster is an orange bar with an image of officers with players at the left and a baseball with a hand and "RSVP / Giants" over it at the right. Above the images is ticketing information in black.